Paryments for children will be increased by €6 per week. 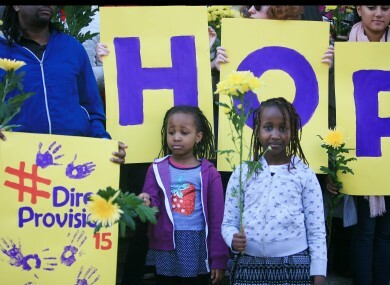 Stephanie Nganga aged 5 and Tatiana Nganga aged 8 taking part in a moment of silence for victims of Direct Provision by asylum seekers at a demonstration last year. THE DEPARTMENT OF Social Protection has announced that there will be an increase in the allowance paid for child asylum seekers. Currently, an allowance of €9.60 per week is paid for children living in Direct Provition accomodation centres. This will be increased to €15 per week. Under the system, adults living in these centres receive €19.10 per week from the State. Speaking today Tánaiste Joan Burton said the government is committed to ensuring a more compassionate system which offers dignity and improves the lives of those who are waiting for their applications to be processed. “This will have a positive effect on all children residing within the Direct Provision system and provides for a modest increase in the income for families, enhancing their social inclusion and integration into local communities,” she said. The decision is being made as an interim step while the working group report on direct provision is being examined. Minister for Justice Frances Fitzgerald said the increase should not be seen as an isolated measure and more reforms in the asylum system should be expected. Email “Government to increase allowance for child asylum-seekers ”. Feedback on “Government to increase allowance for child asylum-seekers ”.